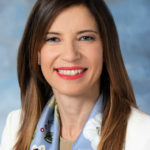 In 2015, Silvia stepped into her current role of Vice President Ethicon EMEA, responsible for regional business strategies for Ethicon’s surgical technologies and solutions including sutures, staplers, energy devices, trocars and hemostats and the commitment to treat serious medical conditions like obesity and cancer worldwide. Johnson & Johnson’s Credo has remained her personal passion throughout her career, always keeping patients and customers central in her thinking. Silvia lives in Rome, Italy, with her husband and two daughters.